**First pressing of 300 copies** Incisive new compositions synthesising and playing with the forms of various religious musics. A haunting, mysterious, and yet somehow humourous thing. "The subtitle of this album describes it as "messa in scena arcaica per strumenti elettronici e voci ingannevoli" - a play of words which could be translated as "mass in an archaic scene (or archaic enactment) for electronic instruments and deceptive voices". 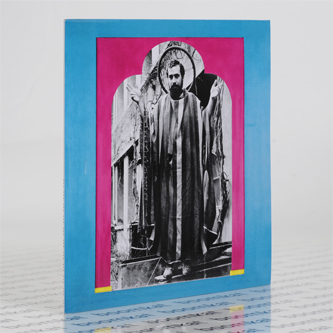 The italian graphic designer and musician Marco Papiro deliberately plays with different forms of religious music, and loosely oscillates between the spiritual and the illusory world, starting on the cover where we can see a self-portrait of his father disguised as a saint with a steering wheel in place of the halo. as for the voices, they are deceptive in a double sense... Not only because they seem to promise eternal bliss, but also because they are completely artificial, and have been masterfully created - like everything here - from scratch with an array of aged modular synthesizers. It's the thin line between the human warmth and the eeriness of its simulation that makes up the fascination of the music on "teopatia", which by the way is the term used to describe an indirect divine contact. Though this record might be too odd to become a religious classic, it might very well help future generations understand the turmoil of an early 21st-century youth converting to synthesizers after growing up with catholicism."